Microsoft up until now made no secret of wanting to merge the classic Windows Control Panel with the Windows 10 Settings menu to improve usability in regards to customizing and configuring the operating system. The company introduced Settings back in Windows 8 and expanded it in Windows 10. While that is the case, Settings still lacks many options that users only find in the Control Panel. One of the issues here is that users have to juggle between the two programs, and that it is sometimes difficult to find a setting. 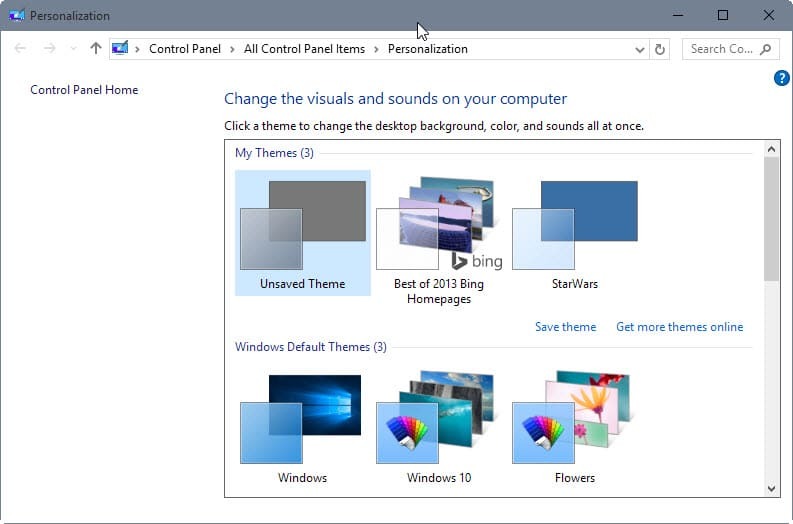 The Control Panel applet Personalization has been crippled in Windows 10 as most of the options it provided in previous versions of Windows were removed from it. If you open it by right-clicking on the desktop and selecting Personalize from the context menu, you will notice immediately that it acts as a theme selector now exclusively. 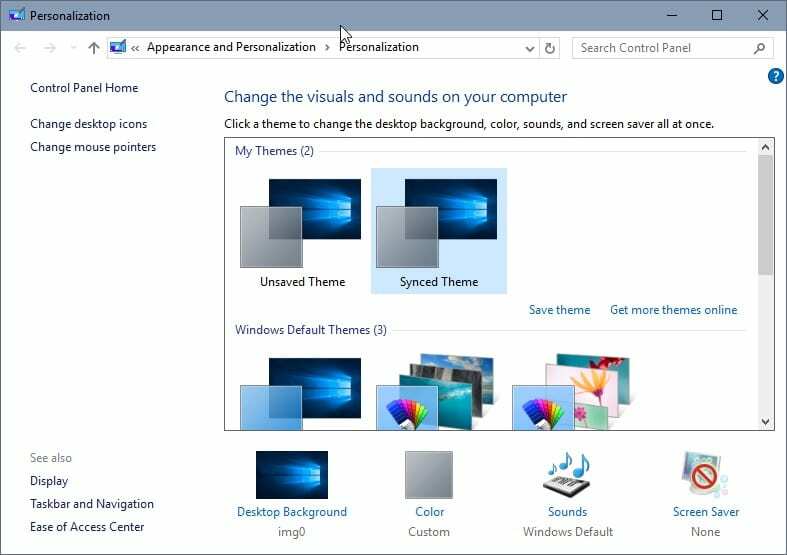 Third-party apps like Personalization Panel for Windows 10 were created as a response to bring back those options. While you get most options in the new Settings app as well, they are divided onto multiple pages in it. If you run the latest Windows 10 Insider Built -- Built 10547 -- you may have noticed already that the Personalization Control Panel applet has been restored fully in that build. As you can see on the screenshot above, all options have been restored when you open the Personalization menu in Windows 10's latest build. While the options are there, they work different than before. When you click on an option, say Desktop Background for instance, you are taken directly to the Settings app where you can modify the wallpaper of the system. The same is true for desktop background, while all other links, sounds, screen saver, change desktop icons and so on open the Control Panel applets instead as they are not integrated in Settings yet. This is the first instance that I know of where entries were restored or added to the Control Panel in Windows 10. One would expect it to go the other way considering Microsoft's intention to do away with the Control Panel and replace it fully with the Settings application. This leaves the question why Microsoft did that. The company has not mentioned the change so it is all guesswork but the explanation that makes most sense is discoverability by users. A right-click on Personalize on the desktop opens the crippled Personanlization menu in Windows 10 RTM currently which users cannot do a lot with. This has likely been irritating to users who have upgraded to Windows 10, and Microsoft's way to remedy the situation is to introduce the classic options again in the menu. The change is only available in the latest Insider Build. As is the case with these changes, they may or may not propagate to the release channel. Microsoft restored the classic Personalization Control Panel applet in Windows 10's latest Insider Build. First move, now bring back the windows update function panel. Just copy the .cpl you want from Windows 7. They are just testing something. The whole Control Panel is going to be removed. I hope not. The settings joke app on the other hand has to go. The Control Panel is better in every way. does command “control color” for Win+R still work on insider builds the same way it is on 10240? I hate Windows Settings app. I wish they would put everything in the Control Panel where it works better. It is really funny. MS improves the newest system returning to previous solutions. Am I the only one who notices how big absurd is such development? Your comment makes no sense. Microsoft tests all sort of things during development. Flyer, I also noticed it, seems as if they’re testing in retro? Maybe they forgot and now discovered the solution in XP? They are truly testing all sorts of things during development but now confused? Its called the Legacy Control Panel and has been since two years, still waiting while we’re headed for the third year now, at this paste we might end up with it sometime next year. Oh and by then you’ll have to renew your Paid Prescription Plan too that Microsoft seems to be setting up.